We can make medicines for those with special needs - such as gluten free, dye free, or formulate into solutions such as lollipops or gummies instead of pills or liquids. We even make special medications and formulations for pets too. Whether you occasionally take a pharmaceutical like an antibiotic, or count on a drug long term such as a cholesterol health lowering statin, your need for specific nutrients increases. You must be aware that many prescriptions, as well as commonly used over-the-counter drugs, cause potentially serious nutrient depletions. For your convenience, we here at Kapler's Pharmacy have devised a Drug-Induced Nutrient Depletion Chart with a list of drugs and non-prescription medications and the nutrients they deplete. This in turn will give you an idea of the nutrients your body needs, which can be found in our high-quality supplements. 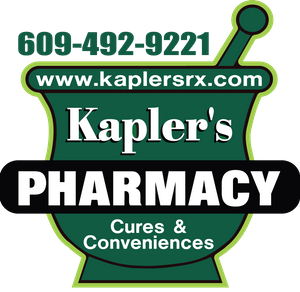 Visit our sister store Kapler's Pharmacy on LBI! Our sister store Hot or Not Yoga is located in Manahawkin, NJ. For more information about the studio please visit www.hotornotyoga.com. Set reminders at any time of the day to remind you to take your meds. 255 East Bay Ave, Manahawkin, NJ 08050 | P: 609-994-3588 | F: 609-994-3706 | Monday-Friday: 9a.m.-6p.m. | Saturday & Sunday: 9a.m.-1p.m.